In today's article we discuss Quick Sort in Java. Quick sort is based on a divide-and-conquer strategy as is the merge sort. It starts by picking one item in the entire list to serve as a pivot element. It then reorders the list so that all elements with values less than the pivot come left of the pivot, and all elements with values greater than the pivot come after it (a process often called "partitioning"). It then picks a pivot for the left side and moves those items to the left and right of the pivot and continues the pivot picking and dividing until there is only one item left in the group. It then sorts the sub-lists to the left and the right of the pivot using the same strategy, continuing this process recursively until the entire list is sorted. There are many variants for picking the pivot, partitioning the list, and halting the recursion. Quicksort is a comparison sort and, in efficient implementations, is not a stable sort. Choosing the pivot is an essential step. Choosing randomly: still a bad choice. This is a bad choice; the pivot may turn to be the smallest or the largest element, then one of the partitions will be empty. Choosing the median of the array. The median-of-three choices: take the first, the last and the middle element. Choose the median of these three elements. Partitioning is illustrated in the example above. 2. We select a larger value to go to the right and smaller value go to the left. When both i and j have stopped, the elements are swapped. When i and j have crossed, no swap is performed, scanning stops, and the element pointed to by i is swapped with the pivot . I have taken Pivot as middle element. you can take any element as Pivot. if(low>=len) return; // checking the length of array is Zero. moving upto less than pivot value from start. moving upto greater than pivot value from end. 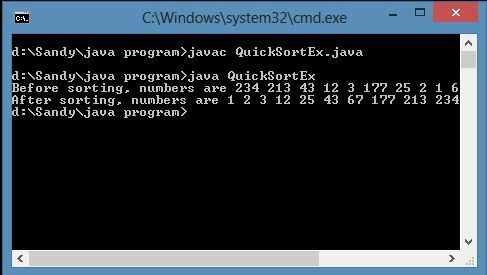 initializequickSort(a,low,l);// sort left part of the array.